For years now, I have been complaining about excessive focus on "diaphragmatic support" in singing tuition*. Although breathing involves the diaphragm, support of the vocal tone actually uses deep core muscles, and the diaphragm is not under voluntary control anyway so telling students to "support from the diaphragm" is pointless. And yet the other day I found myself teaching diaphragmatic support.....because for one student, it was the right technique. She needed a counterbalance to her tendency to pull in her upper abdominals (shrinks the waist but is disastrous for singing). In effect, she was singing as if she was wearing a corset. And therefore she needed a singing technique specifically designed to counteract the constrictive effect of a corset. For her, it worked. For most people, it is unnecessary. The point is that although support of the vocal tone does indeed come from deep core muscles, the diaphragm itself plus the intercostal muscles and upper abdominals (which are incorrectly called the "diaphragm" by most people) still have a role to play, and when they don't do it adequately, the rest of the system doesn't work properly. But that doesn't mean that they should be the only - or even the main - focus of technical singing tuition. We can say that "diaphragmatic support" is an inadequate but occasionally helpful description of the role that the diaphragm and associated muscles play in the physical generation of singing tone. Now, you don't really think this post is about singing technique, do you? Of course not. I am using this as an analogy for the money multiplier, about which there has been a fierce debate in the economics blogosphere ever since the Bank of England produced its (now notorious) paper on money creation. I have been saying for years now that the money multiplier does not adequately explain how money is created in a modern fiat money economy. In particular, the idea that banks are passive intermediaries who simply respond to injections of central bank money by creating more loans is fundamentally wrong. Banks actively determine the amount of "inside money" circulating in the economy. When they create loans or buy securities, inside money increases. When loans are repaid or written off, or securities are sold, inside money reduces. The constraints on bank lending are multiple and complex, and don't include reserve availability (though the price of reserves is a constraint). The Bank of England's description of the process is broadly accurate. The money multiplier was therefore pretty much constant, not because banks weren't increasing lending but because the central bank was increasing base money in response to the increase in bank lending, or perhaps vice versa. 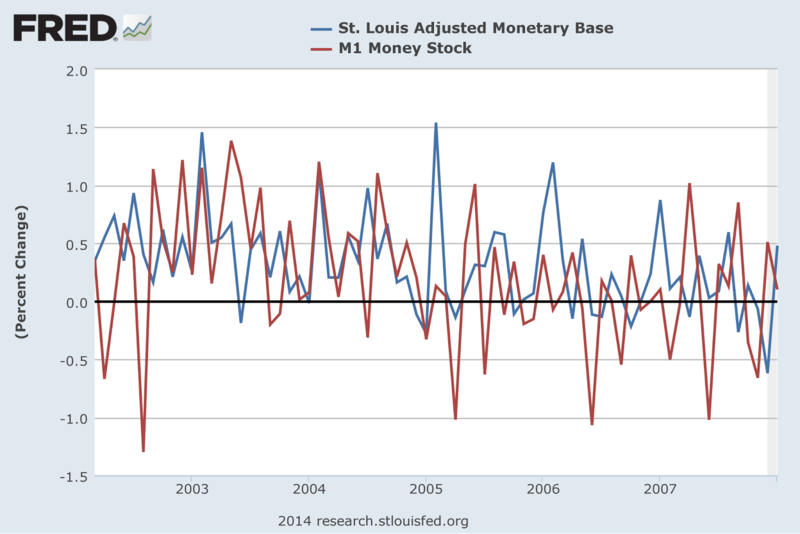 When base money and M1 are so closely related, the money multiplier tells us very little about aggregate demand. No wonder various "modern money theorists" describe the money multiplier as a myth. But of course that is how things worked before the 2008 crisis. Since the crisis, central banks have been creating base money at an unprecedented rate. And now our money multiplier might actually be some use, since base money is no longer simply responding to reserve demand - it is exogenously determined. Oh wait, though....LSAPs cause M1 to increase too, because most purchases are made from investors rather than banks. Therefore M1 itself is now to a considerable extent exogenously determined. So the money multiplier now tells us even less than it did before. Of course, you might believe that the behaviour of one monetary aggregate gives you enough information to enable you set a credible path for future growth and/or inflation, and you don't need to concern yourself with the mechanism by which this controls aggregate demand. But if this is your belief, then you are similar to a singing teacher who is not remotely interested in the behaviour of the deep core muscles but believes that getting the diaphragm properly braced will automatically result in the whole skeleto-muscular system working efficiently to produce the desired singing tone. I suppose it's possible, but it seems a pretty heroic assumption. Is there really a reliable mechanical relationship between base money and broad money that can be exploited solely by controlling the base without taking account of the role of bank lending decisions in the multiplier effect? It seems most unlikely to me. Monetary wonks may at times find the money multiplier to be the most effective way of explaining some particular aspect of the monetary system, just as I found diaphragmatic support an effective technique for my "virtually corseted" student. Indeed I used the money multiplier myself recently in a post about the IS-LM model in an endogenous money context. It is therefore occasionally helpful. But I don't think it is by itself an adequate description of how the monetary system works. And I can't see how the money multiplier is remotely suitable for teaching to first-year economics undergraduates, or first-year students of banking and finance for that matter, unless it is accompanied by modules that explain how bank lending and broad money creation work in practice. I'm with Simon Wren-Lewis on this. At undergraduate level, the money multiplier is long overdue for replacement with an accurate description of how money creation actually works in a modern fiat money economy. Disclaimer: I was taught the money multiplier myself as a first-year MBA student. * In classical singing, diaphragmatic support technique braces the upper abdominals and intercostals to keep the diaphragm taut as breath is released, enabling the student to maintain constant subglottic pressure. In classical acting, diaphragmatic support involves a hard outwards push from the upper abdominal muscles, creating a powerful edged tone. The classical acting version is used in contemporary musical theatre. You really wanted to know that, didn't you? I think it was refreshing that the BoE published the paper. Certainly the money multilplyer description should not be taught. As an answer to the question ,what is the mechanism by which bank deposits are created , it is wrong. Reserves are not used for creating the deposits, they are used in facilitating the settlements made on the net difference between the cheques exchanged between banks. However I see there is a kind of multiplier process that does occur where a single sum of reserves facilitates the creation of a multitude of deposits as it passes from one bank to the next encouraging the creation of loans as it goes due to the banks not having to incur the cost of borrowing reserves. 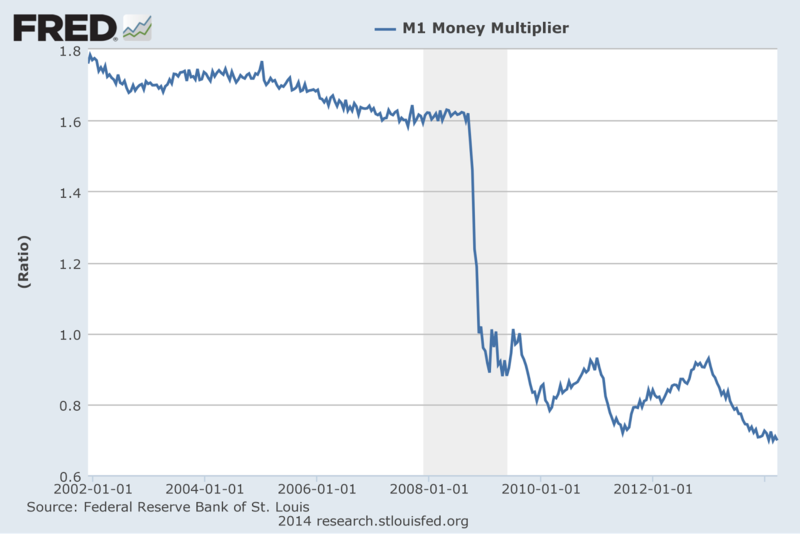 But that is not the money multiplier that people refer to. I agree that Monetary wonks may at times find the money multiplier to be the most effective way of explaining some particular aspect of the monetary system. I'm interested in 'the persistence of inadequate ideas' as a concept rather than the finer details of the monetary multiplier in this case. This for me is about institutionalised teaching feedback loops. I remember in my final couple of years in the civil service waiting for a new economics textbook to come out that accounted for the banking crisis in a big way - ie not just an end note chapter but integrated into its content, and one that also had something beyond the very basics of environmental economics. (Ie something more than the steel mill vs fisherman model). I guess my question is about time lags and institutionalised 'bite points' where new knowledge or analysis becomes available, but takes time to seep through to the mainstream. It's a bit like guidance from central government departments. I remember on a number of site visits in previous policy areas being surprised at how many 'policy iterations' local areas were behind. In some cases all this was, was the renaming of an acronym for no apparent reason than the minister's preference. (Not good in days of regular reshuffles). Liz Truss MP's speech on teaching at the Reform think tank on 10 April makes the same point. Visiting a school in her county, she found teachers doing paperwork that had been scrapped by her department a couple of years previously - so why were they still doing it? Hence my interest about how institutions can use social media as a much better way not just of issuing guidance, but of formulating it and getting instant feedback from it. Indeed, this was the substance of Simon Wren-Lewis's piece. It's very hard for teachers of economics - or singing, for that matter - to abandon what they themselves were taught. And it is even harder for the writers of textbooks to do extensive revisions, or indeed for schools and universities to obtain new resources. Consequently inadequate ideas continue to be taught, learned and believed. I am glad to seek out so many useful info right here in the submit, we'd like work out extra techniques in this regard, thanks for sharing.